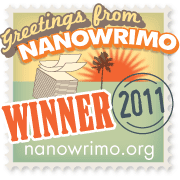 Camy's Loft: I finished NaNoWriMo 2011! This is what you needed to finish? Didn't know it was that time of the year again! Glad you finished! I am happy for you- I won't get to finish this year but I will definitely get my patch next year.. Can't wait to see it in print.